The ever-prescient Londonist recently pointed out the average cost of a working Londoner’s lunch; a conservatively-estimated £830 p.a. And if you factor in visits to Pret A Manger you can add a few more hundred quid to that bill. Then you’ve got the choice of dining ‘al desko’ or trying to find a free square of grass (or more likely, pavement) to eat it on. In King’s Cross, where more and more workers are arriving in their new office quarters each day, a new park has materialised but it’s already obvious that it’s far too small for the area’s workers, who’ll either use canteens or the ‘public-private’ spaces around town that have headset-monkeys on constant patrol. Most shop-bought lunches are too poorly designed to be eaten easily in public anyway. If you’ve ever had a salad blow away in a London park, you’ll know the pitfalls. Bringing food from home has a working class connotation in the UK. Yorkshire workers once brought ‘snap-tins’, tins with lids that sprang shut, and lunch became generically known as your ‘snap’. In the far South, the folded crust of the Cornish pasty allowed it to be held in one hand to make for easy eating. Therefore, manual labour and packed lunches went hand in hand. I was surprised, then, when I went shopping in a Spanish department store, and found an entire section dedicated to the art of taking food to work. There were hundreds of elegant leather bags to choose from, with cooling pouches, trays, cups, sauce containers, condiments and foldaway cutlery. Suddenly, making your own lunch seemed like a really stylish status symbol-type-thing rather than a vaguely embarrassing experience suggesting you were a bit hard up. Perhaps we’ll see the arrival of the middle-class homemade lunch? Looks like the Japanese have got it sorted. Really? I suppose you had school dinners. We had “lunch boxes” from home, tin boxes with lithographed designs, space inside for sandwich, cookies, piece of fruit and a thermos for milk or cocoa, depending on the season. Mine was oval, made to look like a trolley bus with the handles forming the overhead poles. That being so, taking a lunch to work was scarcely a class thing. The teachers I worked with mostly brought lunch from home – leftovers to reheat or fresh made – although some did stop on the way to buy something to go into the staff frig. Would you believe people go into a staff frig and steal lunches? 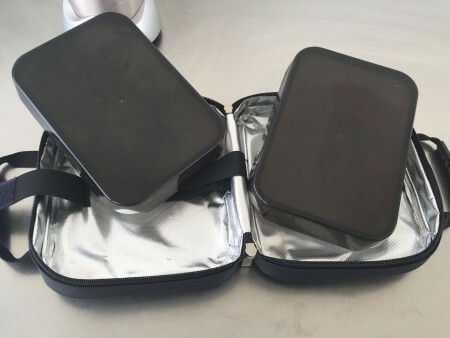 There are all sorts of lunch carriers now, mostly advertising how eco-friendly they are and reminding us that take out containers are wasteful. A friend of mine used to call me the wax paper queen because I still wrapped a sandwich in wax paper. Just hope these won’t be bought by the type who breakfasts or puts on make up on the tube: please don’t add sushi preparation! Wasn’t it that pasties in Cornwall could just be dropped down the mines for catching, hot from wife’s oven, rather than to hold in a hand. But that may be a myth. Tin box? You were lucky! Best I could do were a brown paper bag. But I’m getting ahead of myself. School lunches were provided, [1944 Education Act], served on prison style trays with individual sections, that meant by the time you had eaten your meat and veg, the custard on your dessert had hardened to a rubber-like consistency. But the cooks took great care to make sure the colour of the custard and sponge matched by dyeing them both with a good dollop of ‘health-giving’ synthetic food colouring. Oh yes, the congealed custard. You weren’t then allowed to bring your own lunch. Another thing about the cornish pasty – the tin mines were rife with arsenic, so the crust was a way of holding the pasty while eating without poisoning yourself. You would then throw away the crust, or offer it as a bribe to the “Knockers”, mischevious cornish mine sprites of legend, in an attempt to stop them causing you bother! ** best pasties in Cornwall are made by Philps bakers. They do mail order too! You weren’t allowed to bring lunch from home? To prevent envy in others or to ensure you had a “nutritious” meal? About grade three the parents began providing hot soup and/or cocoa for a price. We could also order half pints of milk either plain or chocolate. I ordered chocolate because plain tasted awful and it was only years later I discovered that my mother skimmed the cream at home for the adults’ coffee and the school milk was whole milk. “You kids didn’t need the butter fat.” And they did? She was doing us a favour, of course. Between no candy available until I was six (and we weren’t given it then except for special), skim milk, and plain meals with lots of vegetables we were given a pretty good upbringing. I think to make sure we were all the same, so possibly envy and nutrition. And we had school milk in one third pint bottles, but in the summer it was pretty much ‘off’ and in the winter sometimes had frozen cream at the top. I agree with Porl – Philps are the best. When I visit my parents we usually get one from their place in Hayle. There’s a really good ice-cream parlour in Hayle too called Mister B’s. The crust is what they used to hold the pasty. They used to put jam in one end for dessert at one point.